Renny Harlin's 1995 epic pirate action movie Cutthroat Island is being re-released by Momentum Pictures in the wake of the enormous success of Disney's Pirates of the Caribbean (to be specific, it will be released the same day as Pirates hits DVD in the UK). It's hard to see why Cutthroat Island was not just as successful as Pirates was eight years later. The film has some impressive sets, and more luscious location footage (it was shot in Malta and Thailand, where Danny Boyle shot parts of The Beach, and where Bond and Scaramanga duelled, in The Man With The Golden Gun). It also features some spectacular action sequences, which are generally bigger and more exciting than those in the Disney film. This isn't terribly surprising: Cutthroat Island had a hefty $90m budget (in comparison, Pirates of the Caribbean cost a relatively meagre $125m). Unlike Pirates, however, Cutthroat Island failed to recoup its budget, grossing only about $11m before audiences cast it adrift. Harlin, incidentally, says that the film had a "modest" budget, and, although it wasn't a hit in the US, it did pretty well in other territories, and on home video. In fact, the film bankrupted the studio that financed it (Carolco Pictures, who had recently produced smash hits Terminator 2 and Basic Instinct). Perhaps the failure of Cutthroat Island can be laid at the feet of its cast? As good as she is in the film, Geena Davis' feisty Morgan Adams is no match for Johnny Depp's glorious, swaggering Captain Jack Sparrow. On the other hand, Matthew Modine's foppish William Shaw is an acceptable substitute for Orlando Bloom's one-note hero Will Turner. Maybe audiences simply weren't comfortable with the idea of a female swashbuckler? Of course, Cutthroat Island doesn't have the supernatural elements that helped make Pirates of the Caribbean such a genre-busting hit. Because of BBFC regulations, about new versions of a film having to be the same as previously-released versions if the old version (in this case a VHS release) is to remain in circulation, Momentum's new DVD version is cut by more than a minute. The cuts (things like headbutts from the fight sequences) are handled reasonably well, and wouldn't be noticeable to a casual viewer, but it's something that sours the disc, and prevents it from being the definitive presentation. The Region 1 version is uncut, of course, but it isn't anamorphic, and it doesn't have the bonus materials offered by the Momentum disc. Incidentally, one of the headbutts cut from the film turns up not only in the disc's Making of... featurette, but also in the trailer, making a complete mockery of the BBFC's ridiculous policies. 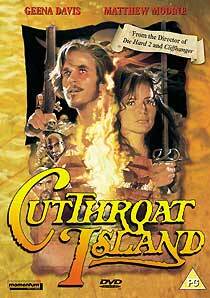 Momentum's Special Edition Cutthroat Island DVD has received a new anamorphic 2.38:1 transfer. The film looks terrific. The cinematography (mostly by Peter Levy, after the film's original cinematographer broke an ankle a week into production) is terrific, and the DVD transfer is sharp and remarkably clean. Framing seems a little tight here and there, but Harlin's constantly-moving camera probably accounts for that. There are signs of edge-enhancement here and there (it's especially evident in shots of rigging contrasting with the sky), and this also occasionally manifests itself in shimmering diagonal edges (aliasing, in other words). There are also a few shots where the image isn't as detailed as it could be, probably due to MPEG compression rather than the fault of over-zealous digital noise reduction techniques. The average bitrate is a very healthy 6.77 Mb/s. The 5.1 Dolby Digital audio mix (at 448kbps) is spectacular, with plenty of atmospheric detail, and lots of carefully-controlled oomph in appropriate moments. The front soundstage has terrific separation, and the directional effects are impressive. The film is supported by a very informative commentary track by Director Renny Harlin, who quickly acknowledges that the film was not a huge hit (something he blames on the film not being targeted to a young enough demographic). He also graciously thanks the listener for choosing to watch the disc (and, by default, listen to his commentary! Harlin has plenty of facts about the film to share, although he can be a little dry, and once or twice is deliberately evasive (he's coy about disclosing the identity of an actor who pulled out of a starring role at the last minute, for example (it was Michael Douglas), but he does reveal that Oliver Reed was originally cast in the role of Mordachai Fingers (a part played in the film by George Murcell, an Italian actor who will be very familiar to fans of ITC TV series). He's also deliberately elusive about how a particularly impressive stunt was achieved, simply saying that it was done with "a little magic". Later, Harlin reveals how he almost drowned a group of stuntmen, because their heavy leather boots became waterlogged, and almost pulled them underwater. He also has some interesting comments about how digital technology is making it easier for directors to accommodate difficult or unexpectedly absent actors. (In this case he's talking about The Singing Detective's Patrick Malahide, whose character was due to die in an elaborate sword-fighting sequence, which Harlin ultimately decided to drop, forcing him to write the character out of the film earlier than expected). The commentary only falters once or twice, and is generally satisfying, but you don't get the feeling that you've necessarily heard the whole story. There also seems to be a minor problem with the commentary not precisely syncing up with the film (perhaps something to do with the BBFC cuts?) At one point Harlin identifies himself playing one of the pirates, but unfortunately he isn't on screen when he says it. The disc has an awkward layer change (at 48'26", near the end of the scene where Shaw is treating Morgan's gunshot wound). On the positive side, the film has its original burnt-in captions, which establish the various different locations. The film has optional English subtitles. The disc contains some worthwhile bonus material, including a six-minute behind the scenes Making of featurette made to promote the film's theatrical release, and a collection of contemporaneous Interviews with Geena Davis (9m), Matthew Modine (10m), Frank Langella (1m) and Renny Harlin (11m), some taken from press junkets, some taken on-set and in costume, and some of it apparently un-edited. They're simple, self-serving EPK (Electronic Press Kit) interviews, but Momentum has presented them nicely, and they include one or two interesting details that aren't covered by Harlin's commentary. The Langella sound-bites were hardly worth including, though: he only says four or five sentences! There are lip-sync problems with the Making of featurette, and the Interviews, which were sourced from NTSC masters. This is unfortunate, and avoidable, but not terribly irritating. The disc also contains nine minutes of raw, unadorned Behind The Scenes B-roll footage, featuring several of the film's elaborate stunt sequences (proving that Davis and Modine performed many of their own action scenes), the sword-fighting scenes, and some impressive pyrotechnics. Sixteen Storyboards are also offered, shown alongside an equivalent frame from the finished film. This is a good way of presenting them, and the boards themselves are artfully executed, so it's a shame that more of them couldn't have been featured. Finally, a dark, narration-free letterboxed trailer (1'18") shows just how bad the film might have looked had Momentum not taken a great deal of care with the transfer. All the bonus materials except for the commentary track have optional English subtitles. Cutthroat Island deserved to be more successful than it was, and hopefully Momentum's disc will help to resurrect its fortunes and reputation. Certainly anyone who enjoyed the swashbuckling elements of Pirates of the Caribbean should feel confident of an equally entertaining experience. 2004 Update - Shortly after this disc was released the BBFC changed the rules about films being issued in different versions. They now allow this, providing certain guidelines are followed (including advice about the two different versions having markedly different packaging).